This fantastic Oregon bicycle tour features Crater Lake National Park, the Cascade Mountains, and the iconic towns of Ashland and Bend. We ride deep into the rugged and forested wilds, alongside cascading rivers, over breathtaking mountain passes, through high desert ranchland, past snow-capped volcanic peaks, and around the rim of majestic Crater Lake, North America’s most spectacular and mesmerizing lake. 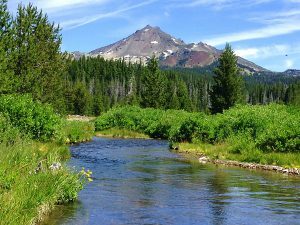 We experience some of the most dramatic scenery and picturesque roads that Oregon has to offer and explore the thriving brewpub, wine, theater, art, and outdoor recreation paradises of Ashland and Bend. Plus, we stay in cozy riverside cottages and the historic Crater Lake Lodge along the way. This is a dream ride for cyclists who love gorgeous scenery. Don’t forget your camera, as the photo opportunities on this tour are abundant. We follow seven designated scenic routes and circumnavigate Crater Lake, selected by Bicycle Magazine as one of the top rides in the US. We begin our bicycle tour the evening before our first day of riding. We meet at 4:00pm in Ashland for introductions and a guide presentation of your upcoming adventure. A tasty, relaxing, hearty dinner (included) will follow, leaving us plenty of time for an evening stroll through the charming, artsy, lively town of Ashland or catch a play at the Tony Award winning Oregon Shakespeare Festival or one of the countless other entertainment venues. Rest well. We have a big day tomorrow. 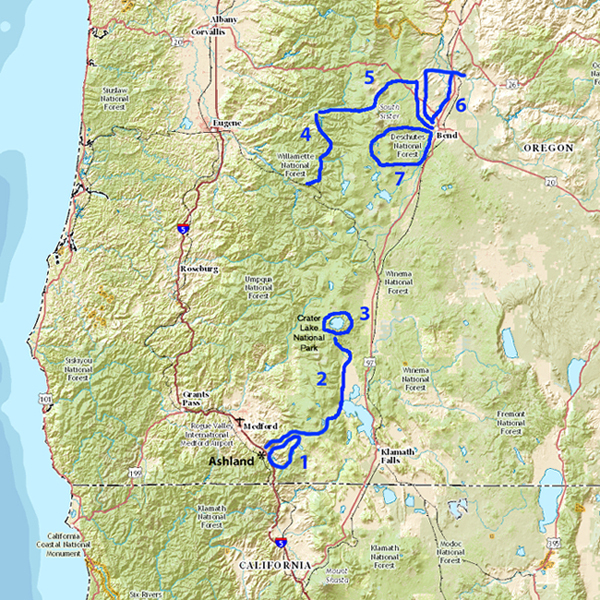 The Ashland to Bend via Crater Lake Bicycle Tour begins with a loop ride out of Ashland along the Cascades-Siskiyou Scenic Bikeway. We start with a gradual climb out of the southern end of the Rogue Valley past tranquil Emigrant Lake with wide open vistas of the Cascade and Siskiyou Mountains we are about to ascend. Our real climb begins in the oak and grass covered foothills and follows a twisting, lightly traveled highway up to a coniferous forest high above us. Just after our first summit, we reach the Green Springs Inn, and the heart of the Cascade-Siskiyou National Monument. We continue with a shorter climb along on a single lane county road to the picturesque Hyatt Lake with the volcanic peak of Mt. McLaughlin providing a postcard-worthy backdrop. A tasty picnic lunch awaits you along the lakeshore. A quick few miles later, including a short, screaming downhill, we emerge onto Howard Prairie with its own, larger mountain lake and fields of wildflowers. At the far end of the prairie, we make one final climb followed by a long, magnificent downhill with vistas of the Rogue Valley, Pilot Rock, Mount Ashland, and the Siskiyou Mountains in the background. The loop ends back at our hotel in Ashland. Day two of our bike tour begins with a rewarding climb back up the hill we came down yesterday, followed by a traverse across the Howard Prairie Plain with stunning views of Mt. McLaughlin in the distance. The road rolls a bit up and down as it meanders through forests and mountain meadows on the way to the inviting Lake of the Woods. Our treat at this point is a smooth, thrilling downhill to the western shore of Klamath Lake, a stopping point for 80% of the migratory birds on the Pacific Flyway. Rocky Point marks our turn northward along the west shore of the lake into the Upper Klamath Basin National Wildlife Refuge. Seventeen miles later, a broad picturesque grassy valley flanked by gorgeous mountains emerges before us. 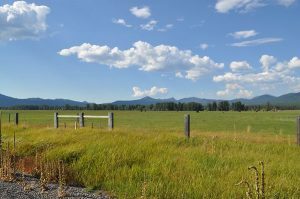 Weaving our way through large cattle ranches we head toward Fort Klamath and join the Volcanic Legacy Scenic Byway. The remains of Mt. Mazama (Crater Lake) beckons us northward as we glide easily through this flat terrain. We stop for a picnic lunch near the border of Crater Lake National Park. The climb to Crater Lake begins here, though nothing too strenuous as we follow the amazingly sculpted ash gorge of Annie Creek Canyon up to the park’s south entrance. A final two-mile steep push gets us to the rim and our first look at Crater Lake. The view is breathtaking and one you will not forget. This is the deepest lake in America and the ninth deepest and one of the clearest lakes in the world. The multiple blue hues of the lake reflecting the stark volcanic background of the crater walls are mesmerizing. A few pedal strokes later, we arrive at our destination, the rustic and magnificent Crater Lake Lodge perched on the crater rim overlooking the lake nearly 2,000 feet below. The Lodge is our resting spot for the next two nights. Relax and enjoy this special place. Dinner at the lodge is on your own tonight. Today is one of the highlights of the bicycle tour. 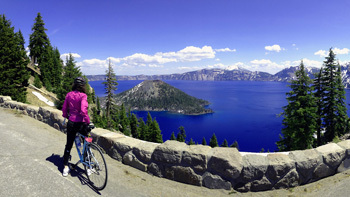 We ride the rim road of Crater Lake, deemed by Bicycling Magazine as one of the best bike rides in America. Take your time on this ride. Allow yourself to be drawn into the frequent pullouts to gaze down at the deep crystal clear blue water and the enchanted and aptly named Wizard Island, or cast a glance away from the lake at the spectacular volcanic peaks that dot the horizon. It is scenic bliss in every direction, but we do have to earn it. There is nary a flat spot on this loop and our lungs will begin to feel the 7,000-foot altitude with our first of four big climbs today. We stop for a picnic lunch near the halfway point around the rim. After remounting our bikes, we begin a steady climb up to Cloudcap Viewpoint, the highest point on the rim. From here it is an exhilarating downhill to Phantom Ship Overlook. After another long ascent and descent, we pass the magical Vidae Falls. One smallish climb later followed by our final major climb we arrive back at the rim to complete our loop. Now it is time for a decision. Relax at the Lodge, go for a hike, or put more miles on your bike by riding the loop in reverse. For those who choose to ride, the views from a different perspective and the ever-changing sunlight effect on the blue hues of the lake make the reverse route experience just as wonderful. Whatever decision you make, it will be the right one. Magic seems to happen at this lake no matter how you spend your time here! We stay at the Crater Lake Lodge again tonight. Dinner is on your own. We start the day with a 2-hour shuttle from Crater Lake to Westfir, Oregon. 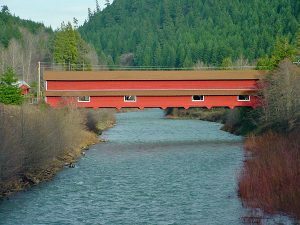 The ride begins at the Office Covered Bridge, the longest covered bridge in Oregon, and the start of the Aufderheide/West Cascades Scenic Byway. From here, we ride up and alongside the North Fork of the Middle Fork of the Willamette River. Traffic is light, the river is stunning, the road smooth, and you may not notice the first 10 miles of climbing. The road ramps up a bit at this point and is a real lung buster just after passing Constitution Grove. At the top is Box Canyon and our lunch stop. A smooth ribbon of pavement is your downhill reward as we drop into the McKenzie River watershed, the South Fork of the river keeping us company under the deep forest canopy. One last short bump in the road gets us to the turquoise blue water of Cougar Reservoir. Terwilliger Hot Spring may tempt you here. Go for a soak, or continue downhill over the Belknap Covered Bridge to our final destination, the McKenzie Riverside Cottages. A delicious catered dinner alongside the McKenzie River awaits you tonight. On the fifth day of our tour we bicycle into a volcanic wonderland, descend to the charming old west town of Sisters, and finish our ride in Bend, the hot spot of central Oregon. 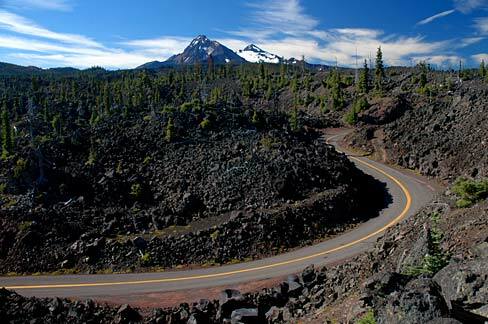 We loosen up those stiff legs this morning with an easy pedal east to the McKenzie Pass Scenic Bikeway. We ramble through an old growth forest, up a tight road with a dozen switchbacks, and emerge onto a lunar landscape of lava and not so distant volcanoes. A few awe-inspiring miles later, we arrive at the Dee Wright Observatory, the summit of our route today. We take in the amazing vistas and identify the nearby volcanoes from strategically placed observatory windows. Back on our bikes, a sweet downhill takes us into the wild-west artsy town of Sisters and a noticeable change in environment. We are in high desert cowboy country now. We eat lunch in Sisters. Stroll around a bit, it won’t take long, before hopping back on your mechanical steed for the last 30 miles of riding along the Twin Bridges Scenic Bikeway into Bend and our lodging at the DoubleTree Bend. Dinner is on your own tonight. There many great options within a few blocks of our downtown hotel location. Today is an optional rest day. Sometimes the body needs a day off the bike! If today is that day for you, Bend’s boutique shops, quaint cafés, wine bars, fine restaurants, street side art, and plethora of brew pubs are awaiting your exploration. If something more active is in order, try fly fishing, paddle boarding, whitewater rafting, or a round of golf at one of the area’s many distinctive courses. Please note that today you are on your own for the expense of lunch, dinner, and activities. These costs are not covered in the Via Bike Tours fee. For those who want to ride, we have a great route today on two scenic bikeways. We begin by backtracking on a portion of the Twin Bridges Scenic Bikeway. This time you are descending and acquiring a whole new perspective on this route in reverse. 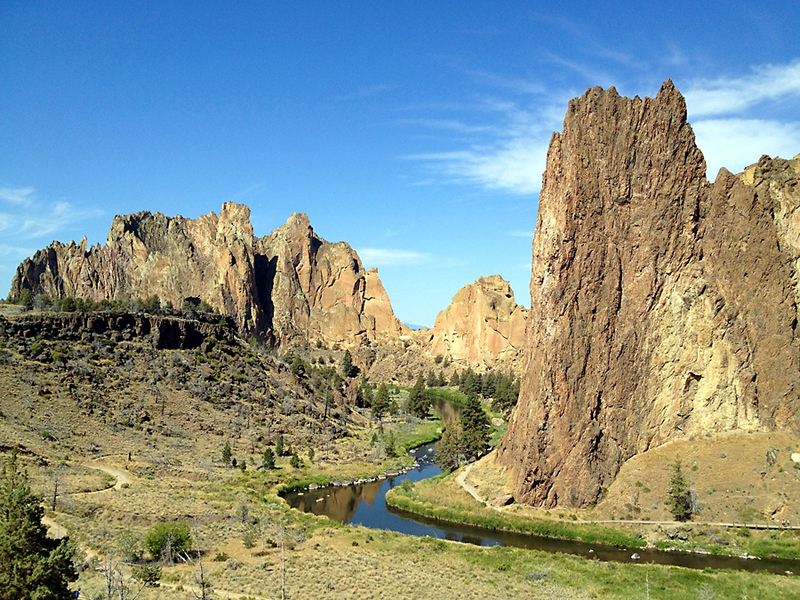 At the 25 mile mark we merge onto the Sisters to Smith Rock Scenic Bikeway and ride it past a variety of historical sites and the gentle curves of the Deschutes River, all framed by spectacular views of the Cascade Mountains and the dramatic walls of Smith Rock State Park. We stop for a lunch in Terrebonne before venturing out to absorb an eye-popping view of the Park’s Crooked River Canyon. Back on our bikes we return to the Deschutes River, following it upstream to Bend. 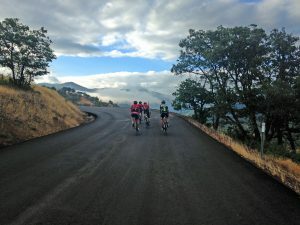 Our last day of riding on the Ashland to Bend via Crater Lake Bicycle Tour is on a classic Bend cycling route along the Cascade Lakes National Scenic Byway. 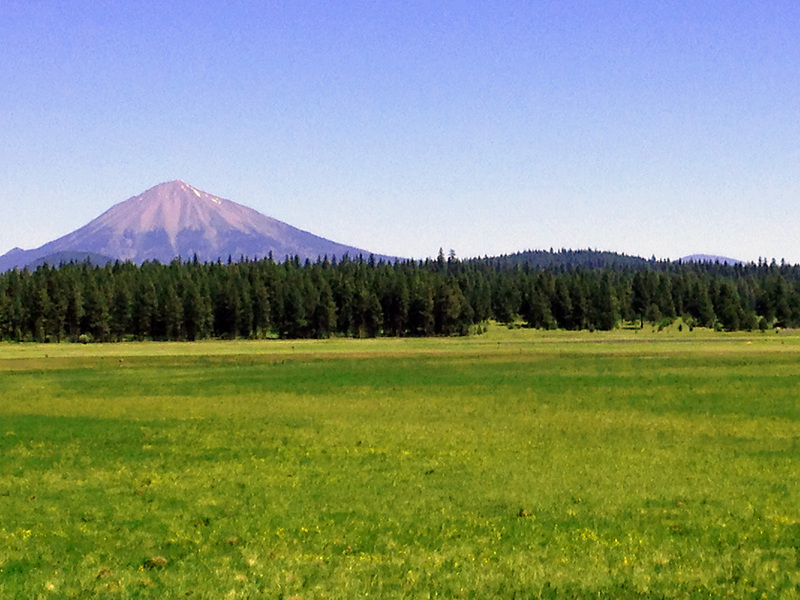 We start by climbing the byway out of Bend toward Mt. Bachelor. 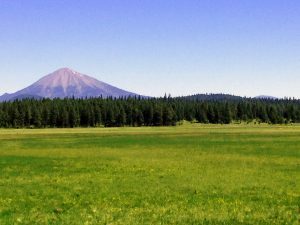 Before summiting the mountain pass, we turn south on a side-road towards Sunriver, then west along a lightly traveled Forest Service road back to the byway. We ride this stunningly picturesque road north, back to Bend. The byway follows a volcanic landscape carved by water and accentuated by 14 alpine lakes with scenic views of South Sister, Broken Top, and Mt. Bachelor. We have a casual lunch at Elk Lake Lodge, known for its Oregon home-style specialties all sourced from sustainable local producers. We may want to take a swim in the lake before straddling the bikes for a climb up the lower flanks of Mt. Bachelor past the ski area entrance. From here it is a fast downhill back into Bend. Yeehaa! Tonight Via Bike Tours treats you to a fine farewell dinner in Bend. We bid a fond farewell to Bend and board our shuttle back to Ashland. Expected arrival in Ashland is 1:00 PM. Come join us on this wonderfully scenic and exhilarating tour by reserving your space now! "What a fantastic tour! It truly was a vacation on 2 wheels and we cannot wait to do another tour. A huge 'THANK YOU' to Jeff and Via Bike Tours!!" "I can't say enough good things about this company or the amazing Oregon Bike trip. Food options, scenery and rides were amazing. I would do another trip with via Bike Tours. I wish it was all over the United States..."
"The daily routes were challenging and very scenic. Almost all of the roads had little traffic which shows that the operator did a lot of planning. Support on this tour was exceptional. Our hotels were first-class, the dinners were very good and the brew pubs were the best." © 2017 Via Bike Tours, LLC. All rights reserved. Site development & hosting by Rogue Web Works.